On February 16, 2018, the Orange County Water District (OCWD) and Orange County Sanitation District (OCSD) hosted Winter Fest, an event commemorating the 10th anniversary of the Groundwater Replenishment System (GWRS). 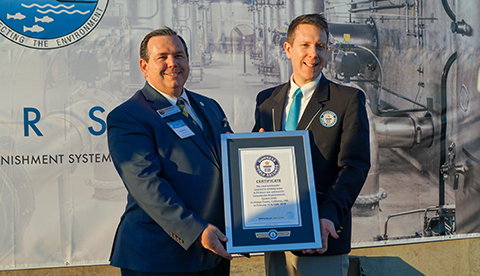 Event-goers enjoyed food, music, a site tour, and took part in the celebratory toast to successful completion of the Guinness World Records title attempt for the most wastewater recycled to drinking water in a 24 hour period. OCSD Board Chairman and GWRS Steering Committee Vice-Chair Greg Seabourn with official Guinness World Records adjudicator. "This is a time to celebrate and learn about this proven technology that is so vital to sustaining our communities and our natural environment," says Greg Sebourn, OCSD Board Chairman and GWRS Steering Committee Vice-Chair. The GWRS is the world’s largest water purification facility of its kind, currently producing 100 million gallons of highly treated wastewater per day that would have previously been discharged into the Pacific Ocean. A three-step advanced treatment process is used consisting of microfiltration, reverse osmosis and UV-oxidation with hydrogen peroxide. The official record attempt commenced at noon on Thursday, February 15 and concluded at noon on Friday, February 16 at which point 100,008,000 gallons of purified water had been produced in the designated 24-hour period thanks, in part, to a TrojanUVPhox™ system installed at the facility in 2008. Our Market Manager, Adam Festger, attended the event, and served as an official witness to the record-setting. 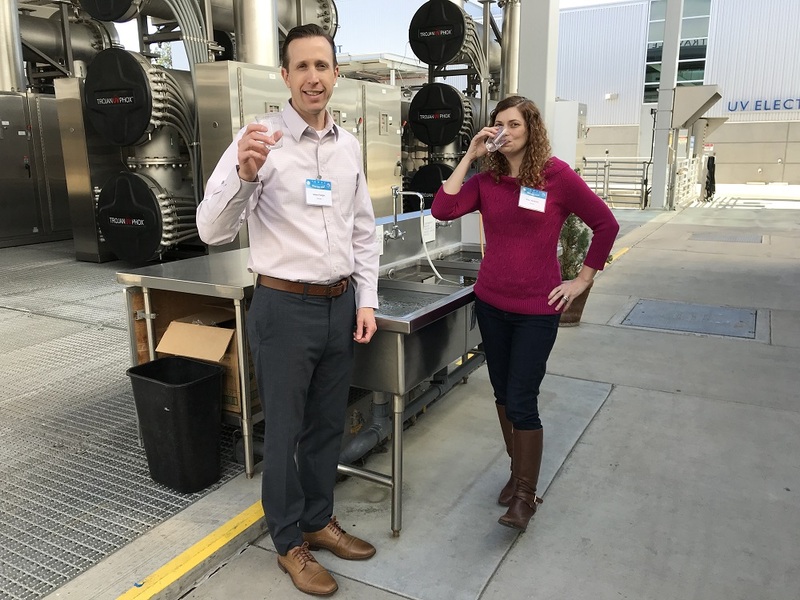 TrojanUV Market Manager Adam Festger & National Water Research Institute's Gina Melin Vartanian toast Orange County Water District’s success in setting a Guinness World Record for the Most Wastewater Recycled to Drinking Water in 24 hours. As we continue to face a time of extreme weather and droughts, and work to better support municipalities in local water supply management, we commend and congratulate the OCWD and OCSD on this notable achievement. For more media coverage of the celebration, explore the links below, and to learn more about the origins of the project, watch the GWRS 10th anniversary video.